Melatonin is a hormone produced by the pineal gland of all mammals, including humans. The pineal is small, light-sensitive organ located in the brain that secretes melatonin only during darkness. Humans begin producing melatonin as early as 3 months old. The production of melatonin increases until age 20 at which point melatonin production begins to decrease. Melatonin affects a number of processes in humans such as sleep and temperature. Melatonin also appears to play a role in the promotion of growth and maturity. Low levels of melatonin in humans have been associated with depression, fibromyalgia, insomnia, some seizure disorders, and other conditions. 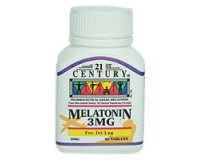 Melatonin is used in connection with a variety of problems including sleep disturbances often associated with jet lag. 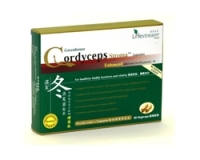 Take 1 tablet half hour before bedtime or prior to boarding the plane before long flights. For jet lag - take it at bedtime for up to 5 days, beginning on the day of arrival at the destination. Meant jet lag only and is not recommended for prolonged consumption. Do not take if you are operating machinery or a vehicle. If you are pregnant or lactating, consult a physician prior use. Contains no added sugar, sodium, starch, artificial flavours, preservatives or animal products.